Here. 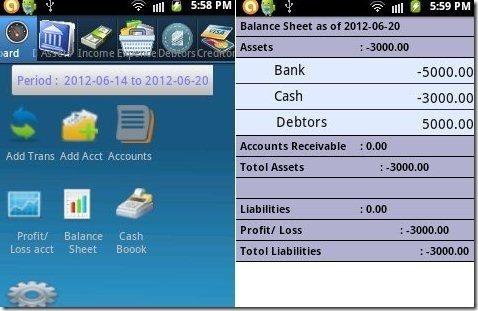 are 3 free accounting apps for Android. Accounting is an important part of any business. There are many free accounting software for PC, as well as online accounting application. However, there are many free accounting applications available for Android as well that let you keep a check of all your accounts while on the move. Google Play Store has many free accounting apps out of which we have discussed about best 3 in the list. Apps Include Financial Accounting Free, Trade Accounting, and AZZURRA Accounting Free. Install any one of them and maintain your books of accounts on Android. 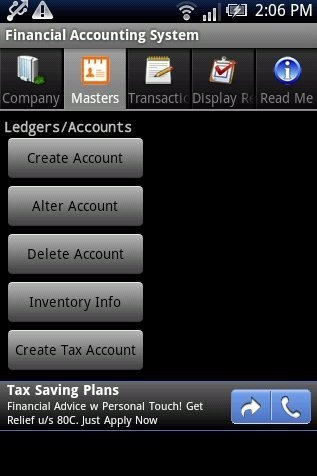 Financial Accounting is a free accounting app for Android to maintain daily financial transactions. This Android accounting app is specially designed for small and medium scale businesses. You can easily prepare ledger account of your daily transactions and maintain double-entry accounting. You can enter daily transaction. The app allows up to 100 transactions to record in the app. 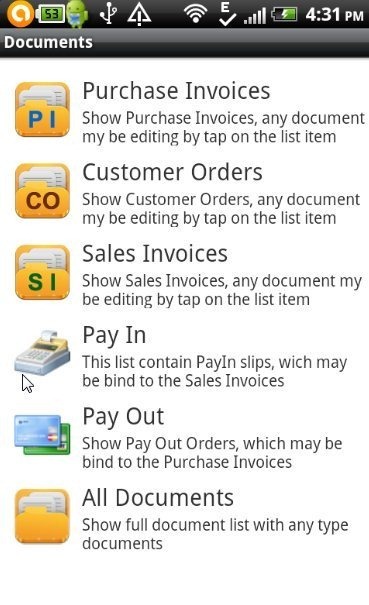 You just have to record the transactions and the app will automatically prepare trial balance, Trading & P&L account, and balance sheet. The app even allows you to create inventory item and tax account. The app has a feature of automatic valuation of closing inventory according to FIFO. Financial Accounting app is nice and useful app to perform accounting on Android. 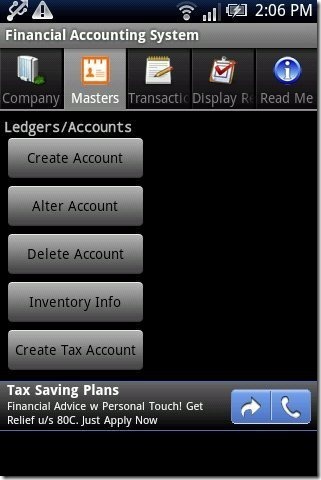 Trade Accounting is a free accounting app for Android to do basic accounting for small business. 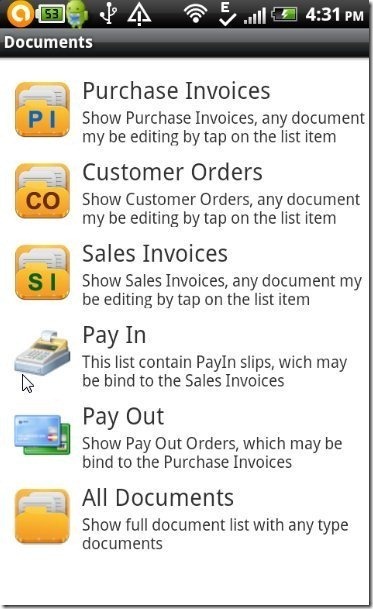 You can create a purchase invoice, sales invoice, customer order, pay in, and pay out. The app is ads free in Google Play Store. I found this free accounting app a perfect way to record all your financial transactions and perform accounting for your small trade. The app is simple and easy to use on Android. You just have to select the type of financial transaction and record the transaction accordingly. All the mutual settlements and inventory are calculated automatically. You can also search a product by its SKU option in the app. The app uses your Android phone’s camera to scan the Barcode. AZZURRA Financial Accounts Free is a free accounting app for Android to record financial transactions and prepare accounts on Android. This Android accounting app is for small businesses. Small businesses can prepare their accounts by passing entries on daily basis. You just have to add transaction or add account to maintain your own accounts. At the end of your financial year, you can check profit & loss account and even balance sheet telling the net profit or loss. The app is smart enough to make the calculations and put the entries by itself. You can even edit any transaction added in the app. 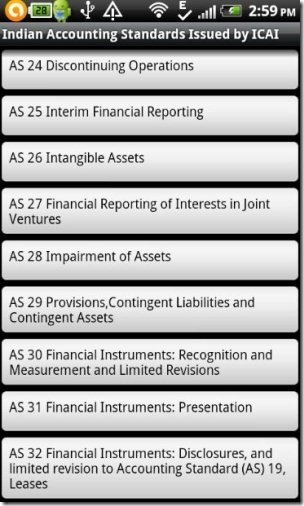 Indian Accounting Standards is an Android app which contains all accounting standards used in India. Now whenever you forget any accounting standard, your Android phone is with you. The app is simple and easy to use. 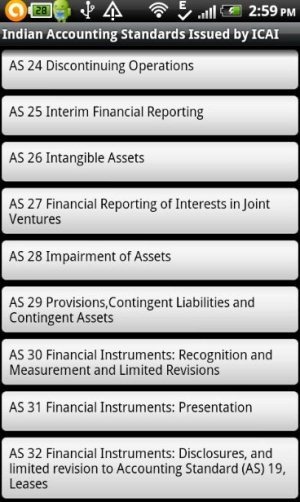 As soon as you launch the app on your Android phone, the app displays all the accounting standards from AS-1 to AS-32. Just tap on any accounting standard and you can see full info about the particular standard. The good part of this Android Indian Accounting Standards app is that the free version is ads free. This app does not lets you do any accounting; only learn about accounting. If you find any other good accounting app for Android, then do let us know in comments. Also check out expense manager apps for Android reviewed by us.